I was watching Peter Gordon on Maori Television making a couscous recipe last weekend and was reminded that it is better just to use cold water to make couscous. Most recipes use boiling water but this can make it gluggy. I also liked the way he blitzed his herbs in a little oil in a food processor which saves a lot of chopping. 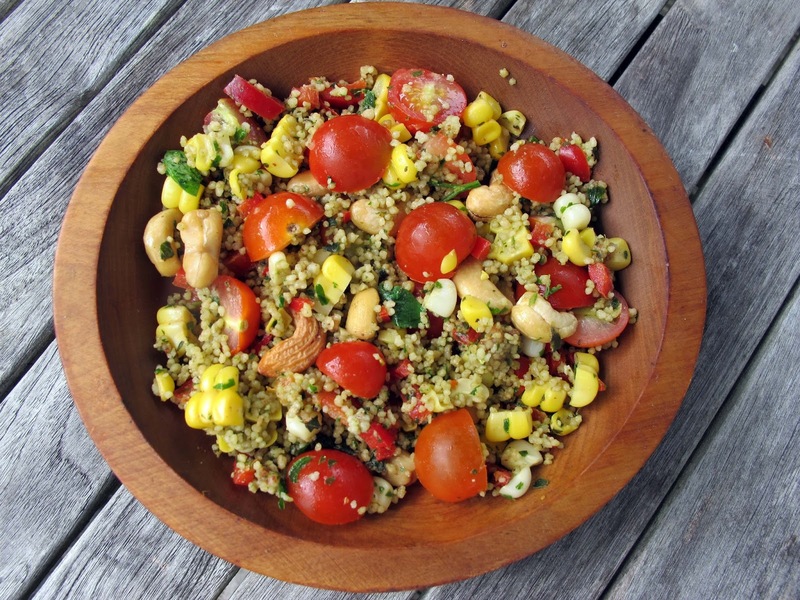 It inspired me to create my own couscous recipe using a bunch of fresh herbs (which seem to be overtaking our vegetable patch and needed culling) and some of our abundant cherry tomato crop. With some red pepper and yellow sweetcorn added in as well it turned into a bright rainbow salad. In the meantime I blitzed a generous cup full of herbs (a mixture of parsley, mint, oreganum and basil) in a food processor in 4 tablespoons of extra virgin olive oil until they were reduced to a textured green sauce. And mixed the dressing through. Time to season with salt and freshly ground pepper and sharpen it with a generous squeeze of lemon juice. And there it was, a meal in a bowl. No standing over a hot stove for this one so just right for the hot humid weather Auckland is turning up all too often this summer. 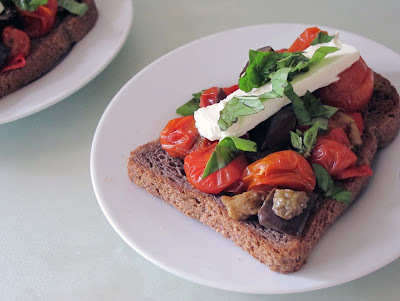 Nigel Slater is one of my favourite food writers and a baked aubergine, tomato and parmesan dish from his book Tender (Volume 1) inspired me to make this spicy toast topper which is a meal in itself. To make it I simply brushed some aubergine slices/cubes generously with olive oil and seasoned them with salt and pepper. These were baked in a 200 degrees C oven for about 20 minutes until soft and tender. In the meantime I chopped a couple of handfuls of cherry tomatoes and halved them). I scraped the seeds out of 1/2 a red chilli before chopping it finely and peeled and chopped a clove of garlic. These three ingredients seasoned with freshly ground salt and pepper were fried in a little oil until they became slightly mushy but still retained some of their shape. The aubergines and tomato mixture were tossed together and piled onto toasted Purebread Glutenfree Young Buck bread. This is a seriously good bread which contains lots of organic gluten free ingredients like buckwheat, tapioca starch, linseed, coconut oil and honey. A slice of creamy feta, and a garnish of slivered basil completed the dish. Any leftover tomato and aubergine mixture will happily sit in the fridge for a few days and can be eaten hot or cold as a side dish. The amount of chilli will depend on your palate. If it's fiery increase, if you are fearful of heat use less. There's something very comforting about a good old cheese and tomato sandwich at any time of day when hunger pangs strike. Some crunchy shredded iceberg lettuce, a little bundle of cheery red pepper slices and a really good chutney and it's a meal. 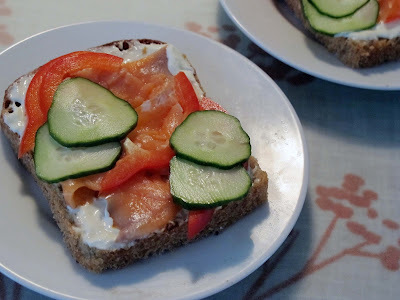 The brown bread I used here was Purebread Young Buck. Buckwheat is a seed not a grain which makes this bread gluten free. But it's so good that anyone would enjoy it. To match the earthy flavour of the bread I filled it with a tasty New Zealand cheddar and served a smokey Feijoa and Lime Chutney (from Te Horo Harvest Treehut Farm ) alongside. This was a much appreciated Christmas present. To make this toasted sandwich lighly butter two slices of Young Buck bread. This will be the outside of the sandwich. Fill with sliced tasty cheddar and vine ripened tomatoes. Fry until the bread is a toasty brown and the cheese has melted. 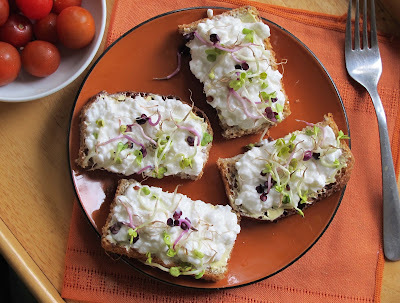 I first got addicted to wholemeal bread, cottage cheese and alfalfa sprouts in the sixties ( as well as to flowing muslin dresses ) Those were the times. But none of the wholemeal breads I baked then were ever quite up to the standard of Purebread Full O' Grain which you can buy now. Although the bread I made from an old colonial cookbook with hops and potato water was, even if I say so, pretty darn good! So here's to memories of good times past, and a retro lunch which is healthy and good. To make it simply pile lots of cottage cheese ( yes, go on be generous there's not many calories in it) onto slices of Purebread Full O'Grain bread. Sprinkle liberally with sprouts , any kind will do, and if you have them growing in the garden as we do, add a bowl of freshly picked cherry tomatoes alongside. Enjoy! We visited Japan earlier this year. and enjoyed trying so many new flavours. Only the bread, usually white sweet and fluffy, was invariably disappointing. It's been great to get back to the quality bread we can find in New Zealand like Purebread Full O'Grain which is naturally and slowly fermented using traditional methods. This results in a tasty, chewy and easily digestible loaf. I love it so have combined it with some Japanese flavours to make a great open sandwich for lunch. To make it mix some wasabi paste into a mixture of sour cream and kewpie mayonnaise. Spread this liberally over a couple of slices of Purebread Full O'Grain Bread. Lay some sliced smoked salmon over the top. Then garnish with sliced red pepper and thinly sliced cucumber which has been marinated briefly in sushi vinegar. Asian Duck Salad in Buckwheat Buns. The earthy flavour of the soft textured buns goes surprisingly well with the Duck Salad. Or perhaps not so surprising after all when you consider that Buckwheat is a plant that originally came from Asia, and was widely cultivated in China in the 13th and 14th centuries. Feeds Two: but you could easily multiply the recipe if you are feeding a family. 2 Purebread Young Buck buns cut in half. Mix the dressing with the other ingredients. Cut the buns in half and generously fill with the duck salad.This recipe was created for my gluten intolerant daughter Rachel who loves Young Buck buns, and for her partner Rod who has a passion for ducks! I found my cooked Peking Duck at "Love a Duck" in the NorthCote Shopping centre in Auckland. You can't miss them. They are dangling side by their feet in the shop window, an appetising burnished brown. You can ask for 1/4, or 1/2 or a whole and they will chop them with a cleaver while you wait and watch. Saves all the hassle of cooking your own! Thanks for pointing me in the right direction Rod! there be traces of gluten in Peking Duck.? I am not sure so for those who must avoid gluten altogether it would pay to check if you are buying one rather than cooking it yourself. Small pieces of mango would make a delicious alternative to the raisins.